In the 1990's a Roman Catholic priest in the war-ravaged city of Sarajevo, Father Ivo Markovic, was faced with a dilemma. His congregation was approaching Easter but there weren't enough choir members left for the music of the season. Marcovic had courageously worked for reconciliation during the war so he proposed creating a choir which would be multi-faith and multi-ethnic despite the antagonism between groups which had led to the destruction of the beautiful city. As one writer put has put it, each tradition carried its own strength. There are the tender words and music of Islam and the playful dance of Jewish music. When they sing Eastern Orthodox hymns it was, he said, as if “we were angels.” Orthodox Christian music richly acknowledges God’s presence on earth. 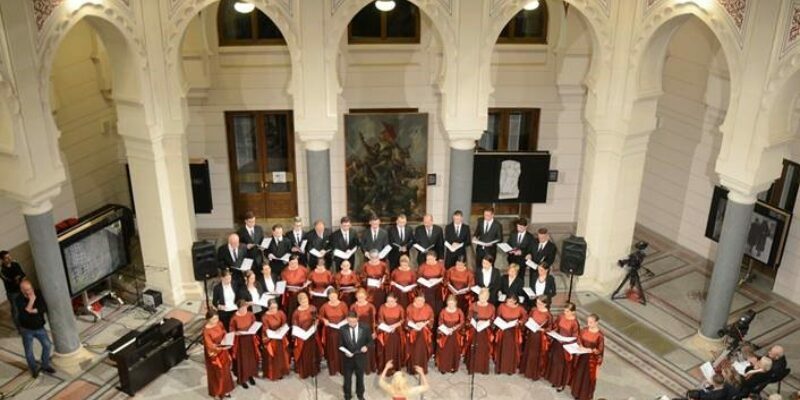 Rather than meeting to talk about peace or how to live together, Father Markovic encouraged the people in his choir to live the dialogue and live ecumenism in their singing together. Twenty years later the choir flourishes and they have performed more than 400 times in various countries. Soon they will tour several cities in Great Britain. For me this is a heartening story, good news and Good News. That is an amazing story - and it sounds like a wonderful choral experience to be part of. We could all use such an experience ! What a wonderful story. Such an enriching experience for all involved. On a smaller scale, when our church and another United church amalgamated, the new combined choir was a weekly,visible sign to the congregation that we could work together, find common ground, become friends. Separately the choirs were struggling but together we brought new life and spirit to our worship. A successful moment on the long amalgamation journey. Nothing like singing in a choir to create sweet harmony! Perhaps not a good time to trot out the old chestnut about how the devil enters the church through the choir loft door! This is a great story, as is yours Shirley. Thanks to you and Judy for your comments.